Kwan Yin (sometimes transliterated as Quan Jin) � which means "observing the cries of the world" � is the Chinese Bodhisattva of compassion. 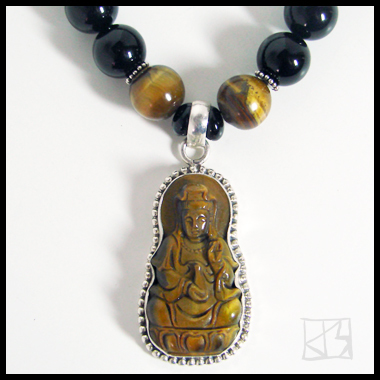 She is the personification of kindness and mercy, the Mother Goddess and patron of travelers. In contemporary terms, she is even considered by Buddhists as the protector of airline travel! She is generally seen as a source of unconditional love. 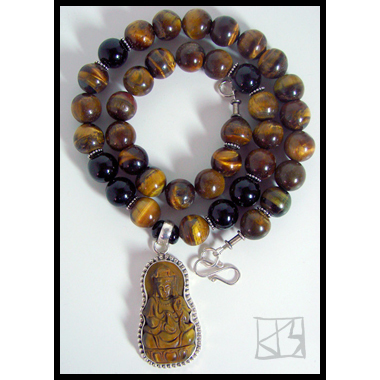 In her bodhisattva vows, Kwan Yin promises to answer the cries and pleas of all beings �people and animals alike � and to liberate them from their own karmic woes. Therefore, this Mother Of The World is a champion of animal lovers, vegetarians and vegans. 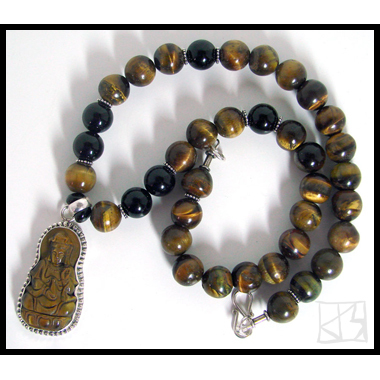 This large artisan piece (56mm x 26mm) is carved from gorgeous chatoyant South African tiger's eye embedded in a thick beaded bezel of sterling silver � solid around the back � and suspended from a strand of matching tiger eye accented with black onyx rounds and Bali silver.